Don’t worry, Madea fans. It doesn’t seem like Perry’s beloved character is the one biting the dust. (Even though he’s been threatening to kill her off for years.) Still, the final movie in his popular series will serve as a farewell to the spiteful elderly black woman audiences have grown to love. Before we say goodbye to Madea (for now …), let’s take a look back at Perry’s creation and all of the shenanigans she’s gotten herself into over the past 14 years. Played by Perry, Madea is a complex woman despite having some cartoonish and comedic aspects. She has a criminal record that stretches back to petty theft at age 9 and continues throughout her life with charges of gambling, fraud, attempted murder and assault. Vindictive and spiteful, Madea relishes in getting even with those who wrong her by any means necessary — and they’re usually illegal or unsavory means. It doesn’t take much to set her off, either. Some of her many pet peeves include disrespectful kids, rude people, lazy people, people who cheat on their significant others — basically, all people. Although she’s a tough old bird, Madea can often be caring and kind, offering her guidance and lending a helping hand to those in need when she can. Madea first appeared on screen in DIARY OF A MAD BLACK WOMAN, in which she played the grandmother of Helen, whose husband kicks her out so he can live with his younger mistress. As an introduction to Madea, it’s a good one: We get to know her as a vengeful, no-nonsense older woman who has a strong (if sometimes peculiar) sense of morality and fairness. We also get to know her as a supportive and loving grandmother, who ultimately gives Helen the courage she needs to stand up to her cheating husband. In 2012, Perry released the first Madea movie that wasn’t based on a play featuring the character: MADEA’S WITNESS PROTECTION, in which his iconic creation takes in a family in witness protection. Over the next few years, Madea’s stories became holiday affairs with A MADEA CHRISTMAS (based on a play), BOO! A MADEA HALLOWEEN (pictured above) and BOO 2! A MADEA HALLOWEEN. The latter two were also not based on plays. 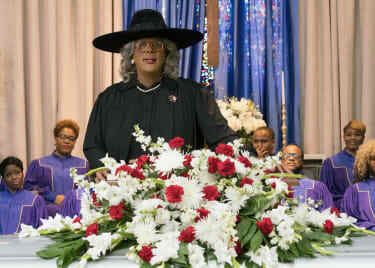 Now, two years after we last saw Madea in BOO 2!, Perry returns to the big screen with A MADEA FAMILY FUNERAL. 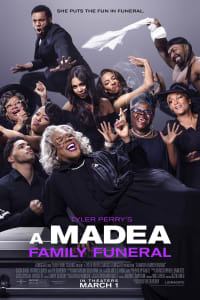 A pleasant family reunion takes a hard left turn (as things often do when Madea’s around) when Madea and her crew are abruptly forced to plan a funeral — one that could reveal some upsetting family secrets. 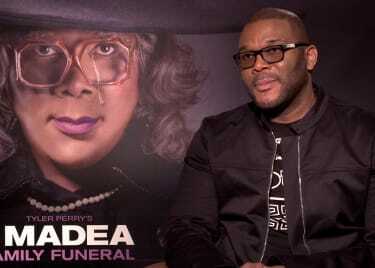 While this won’t be Perry’s last movie, he has said it will be the final one featuring Madea. Even though she won’t be dying (we don’t think), it might as well be a funeral for this iconic cinematic character. Hope it’s a good one! 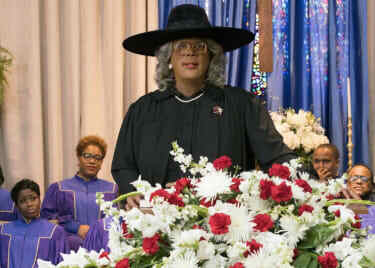 A MADEA FAMILY FUNERAL comes to AMC® theatres on March 1.